BMP's single-tool functionality enables professionals to play, inspect, and verify audio/video quality from various content locations. Interra Systems, media QC, monitoring, and analysis solutions provider, has announced the BATON Media Player (BMP), a powerful new feature-rich media player supporting for the widest range of formats and easy integration with broadcast workflows at any stage. Interra Systems will demonstrate BMP in its 2019 NAB Show exhibit booth. BMP is available as a standalone media player and as an integrated part of BATON. BMP is built for heavy-duty applications and one of the most comprehensive professional media players available. It offers a highly-efficient content readiness process throughout the various workflow stages, from ingest to distribution. The visual and technical information provided by BMP verifies that content looks and plays exactly as intended. 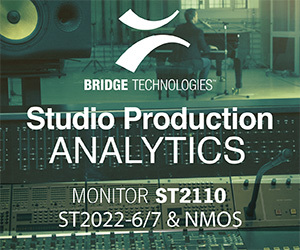 BMP supports SDI playout and a wide range of audio, video, elementary, and container formats, along with extensive support for closed captions and subtitle formats. "Interra Systems has long offered its media player as part of BATON, our acclaimed file-based QC solution. BMP enhances the media player with features that bring greater ease of use and efficiency to a broad range of broadcast and ABR applications," said Anupama Anantharaman, vice president, product marketing at Interra Systems. "Video production and distribution workflows today are quite sophisticated. Having powerful tools to review and rectify quality issues is more important than ever before. We believe BMP will ultimately enable better viewing experiences for consumers." When used for QC, BMP can be set up to play the detected errors in an automated manner, without requiring any manual intervention. It can also be used for fast navigation to different error locations, manual validation of error severity, error region marking, slow playback of the error, and more.